Celebrate the Holidays in the most delicious way. 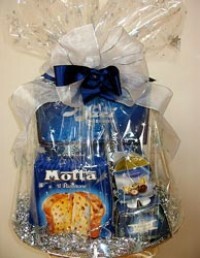 Since the beginning of 20th century, the name Motta has been synonymous with panettone. This One Kilogram panettone is guaranteed to be not only moist, but deliciously fragranced with the sweetest orange and dried fruit grown in Italy and parts of Europe. Accompanied by Perugina Baci Chocolates, Butter and Almond paste cookies and a box of Pernicotti Torrone ready to be used on the Silvercraft tray.